UPPER: Fumba, Zanzibar, Tanzania. August 1971, 33mm long. LOWER: North Reef, Dar es Salaam, Tanzania. September 1973, 45mm long. NOTE the cerata in lower animal proportionally much smaller. The ceratal size can change very quickly and apparently reflects changes in the physical well-being or physiology of the animal. PHOTOS: Bill Rudman. Background colour is brown or brownish-green with a pattern of light, sometimes whitish patches over cerata and body. Also a distinctive pattern of bands on the head. The background colour is caused by the contents of fine branches of the digestive gland which ramify throughout the body wall. In some animals there are traces of a blue subapical band and a yellow tip to the cerata, and Eliot describes a variety ornata with a bright blue submarginal band and Gosliner (1979) reports the same colour form from Hawaii. Baeolidia major amakusana Baba, 1937 from Japan, is almost certainly a synonym. Spurilla major probably keeps zooxanthellae alive in its body. 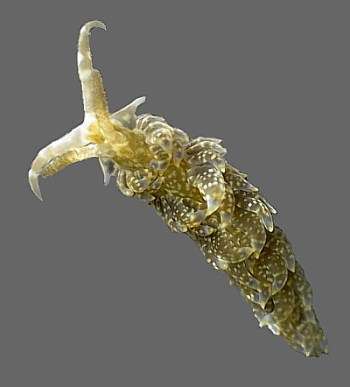 See Solar powered Sea Slug page. See Carol Buchanan's message for a photo of an animal with intense blue markings. •Edmunds, M (1969) Opisthobranchiate Mollusca from Tanzania I. Eolidacea (Eubranchidae and Aeolidiidae). Proceedings of the Malacological Society of London 38: 451-469. •Gosliner, T.M. (1979) The systematics of the Aeolidiacea (Nudibranchia: Mollusca) of the Hawaiian Islands, with descriptions of two new species. Pacific Science 33(1): 37-77. •Rudman, W.B. 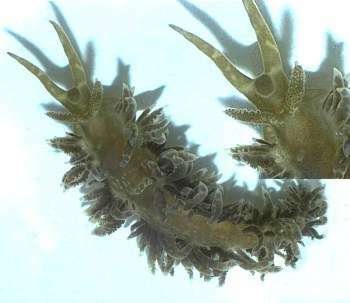 (1982) The taxonomy and biology of further aeolidacean and arminacean nudibranch molluscs with symbiotic zooxanthellae. Zoological Journal of the Linnean Society, 74: 147-196.